Looks like there are lots of potato chip fans among us! Love it. So glad the recipe was a hit. Depending on the week, I might have time to do more, but this is the bare minimum I need to stay organized and to have packable food at the ready when the class bell rings! My buckwheat chai bars were great, but it’s time to expand. 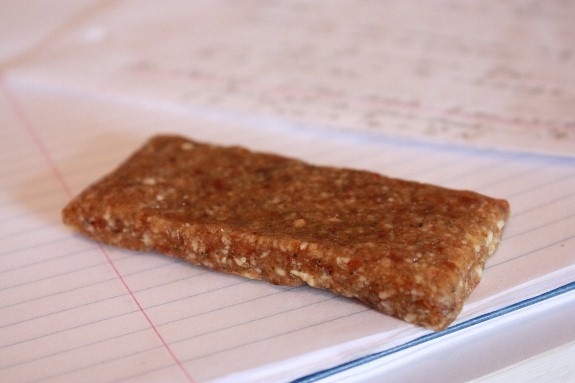 I’ve long dreamed of making a snack bar that mimics my beloved Larabars. Two days ago, I decided that this was the week. 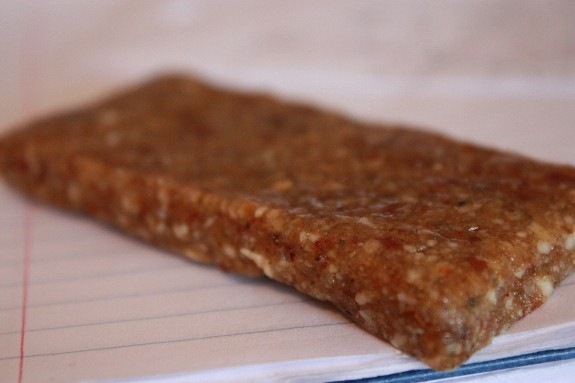 Plenty of bloggers have come up with their own spins on Larabars: Bitt is such a consummate homemade Larabar maker that she calls them Bitt Bars! So this is hardly an original recipe/procedure: it’s just my first stab at a snack staple I’ve been thinking about for a long time. Larabars have gotten pretty fancy lately: some of the new flavors sound more like five star desserts than dried fruits and nuts. But in spite of all the new options, my favorite Larabars are still the original flavors: cherry pie, apple pie, lemon, cashew cookie, and pecan pie. Lemon might actually be the all time favorite, which isn’t surprising, given how much I love all things lemony. So it was only right that I infused my first homemade Larabar with a hint of lemon: not enough to overpower the taste, but just enough to brighten it. A lemon kiss, if you will. I loved the results, and hope you will, too. 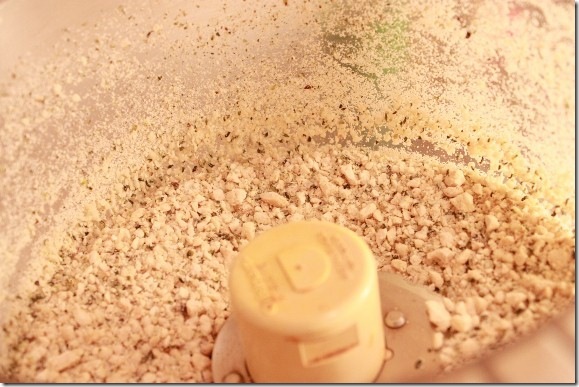 1) Place the cashews in a food processor and process till ground up. 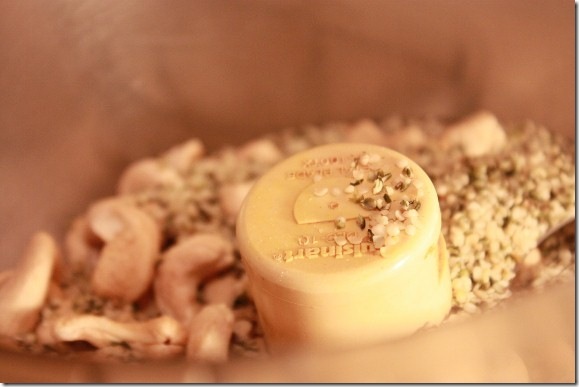 2) Add the dates and hemp seeds and pulse repeatedly. Then, add the lemon and lemon zest and leave the motor on until the whole thing has formed a big, uniform, sticky ball. 3) Take a large sheet of saran wrap and place it over the bottom of a small baking dish. Press the mixture down into it, till it’s even in thickness. Cover with another sheet of saran, and freeze for at least 30 minutes. 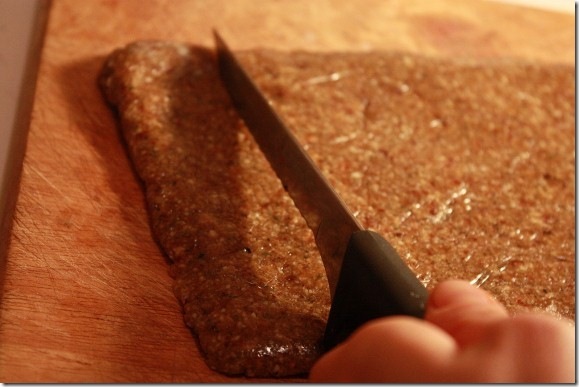 4) Unwrap the “dough,” lay the rectangle flat on a cutting surface, and cut into 12 bars. 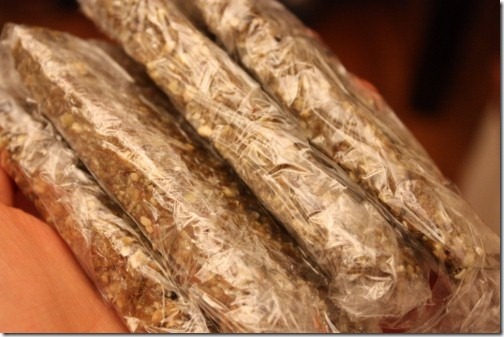 5) Wrap up individually and store in the fridge or freezer till ready to eat. 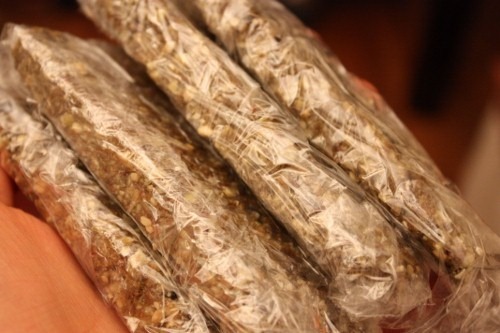 I’m not sure how long they’ll keep, but I suspect up to two weeks is perfectly fine, and longer if you freeze them. Note that these are a bit smaller than your average Larabar: they’re more comparable in size to the Larabar minis than the regular bars. You can definitely cut them larger if you’d like to, or eat two at a time. I vary between eating one along with salads and other lunches, or eating two as a snack. I’m particularly fond of having one or two by my side when I’m deep into studying! If only they could teach me stoichiometry, too. Hope you guys attempt Larabars of your own soon! I found that a 1:1 nut:date ratio, give or take in either direction, works well. I’d love to hear what flavors you all come up with. Thanks for mentioning my Bittbars. I think I have a lemon variety in there somewhere, and I’ve been wanting to do a lime one. I love a good lemon dessert. The only downside to hoemade bars is that they don’t keep the same way the ones lara makes because of their packaging is supposed to keep them fresher. If one of us could figure that part out, well I guess we’d put lara out of business! Hi Bitt! 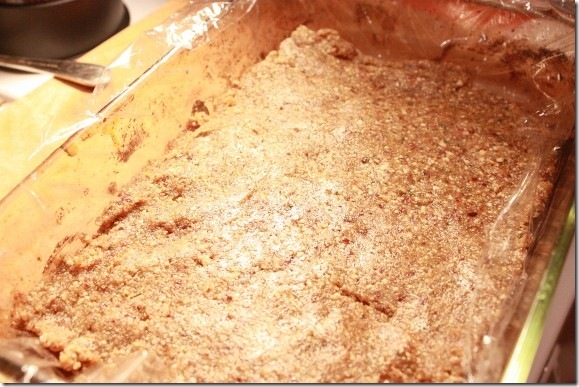 I made one of your bitt bar recipes awhile back and I’ve been searching the web because I forgot the name of your site. Now that I’ve found bittofraw.com it won’t let me subscribe…Can you help? These look delicious 🙂 I so hear you on the requisite minimum food prep. Do you make everything on one afternoon for the week, or do it in several installments? Eeep! Lemon desserts are my favourite (despite my obsession with chocolate, I prefer tangy desserts), and so I WILL be making this. As soon as a finish my batch of cashew fig nut butter which, some to think of it, could probably have been formed into snack bars itself! 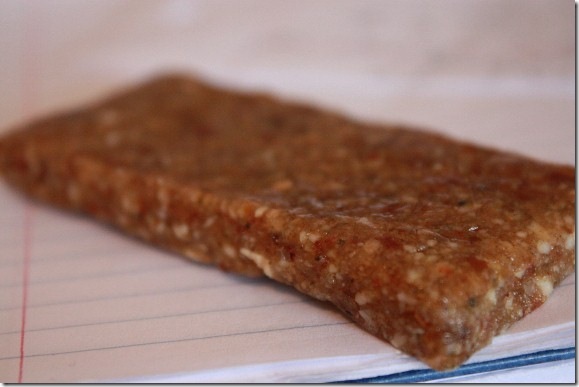 I’ve made several attempts at homemade bars and although they’ve been delicious, I haven’t been able to get the right Larabar texture.. They were always too soft. This is super helpful- I’m now inspired to give it another shot soon! I can almost taste the lemon ZING off the screen. They look wonderful, Gena! 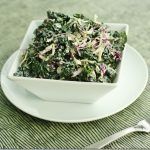 It’s so interesting to me how raw ingredients like lemon, hemp seeds, cashews can be combined to be savory (i.e. 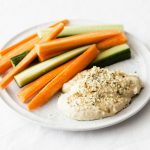 with red pepper and nooch for many variations on cheezy sauces and dips) or added with dates to be more solid and sweet-ish. I love how diverse raw, whole, ingredients can be. What a simply lovely bar recipe. I love lemon. I just stumbled upon a smoothie recipe that I had saved (Vegan Lisa’s Lemon Ginger smoothie). I must make that soon, and now I must make this bar. Hmmm, I wonder how these bars would be with some crystallized ginger added in? Your energy is amazing. So impressed with the way you are keeping up, and your organizational skills. Nice list of weekly staples. Are you kidding? I think crystallized ginger would be INSANELY GOOD. 😀 Ok, Gena. I’m about to go to the store, and planning on getting ingredients to make your bars. I’ll get a little crystallized ginger too. I think I’ll leave half the batch “plain” so I can have the pure, unadulterated Gena Bar experience. Then I’ll play with the ginger in the second half. These look great! I struggle to find hemp seeds here in South Africa. Would it work to substitute with sun flower seeds? Sure! Or pumpkin seeds. Or just use all cashews. These sound amazing! I’m not the biggest fan of larabar flavors but I imagine the lemon gives it a really fresh oomph. 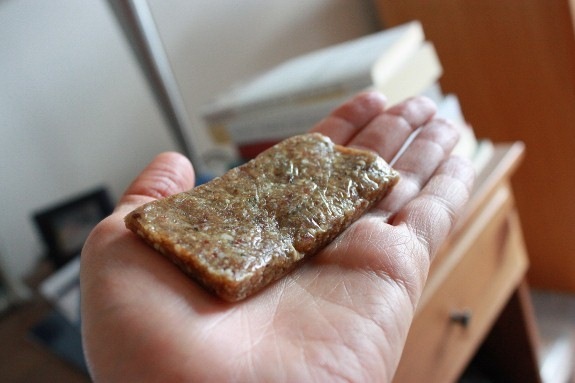 I’ve just made lemon and lime bars in the past week, but held together with irish moss and a little lemon or lime juice and sweetened with stevia instead of dates. Wonderfully zingy, a little crumbly, awesome study break. Any thoughts on my earlier question/comment about doing a NEDA post? (Is there anything I have to fulfill to do it? Sorry Ela! I just responded yesterday. NEDA is officially over, but I think that’s a silly reason not to write a post. Do it! 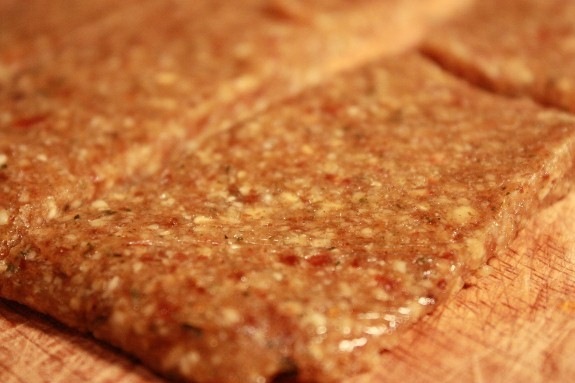 Larabars are such a handy snack and it’s so great to make your own. One of my clients made a peppermint lemon one the other day! Cool! these sound awesome!! I especially LOVE the lemon flavor! I have a similar question to Nata – can you substitute hemp seeds? 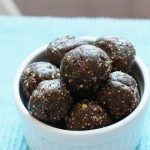 I was thinking of using chia seeds instead – would this work? Should I grind them first if so? I’m going to make these for Playcentre here in NZ! I think you can definitely sub another seed. I actually wouldn’t grind chia, but I’d soak them first, then pulse in with the dates. See if that works. Pumpkin and sunflower seeds would also work, and honestly, you could just do cashews and dates, too. Awesome, thanks so much Gena! You know what I love about your recipes? You make me believe that even *I* can do it! I must make these! I’m going to have to get some hemp seeds. You keep reminding me to give them a try. These bars look like a great snack! Mmmm these sound delicious! I usually don’t like lemon but with the dates and cashews, this sounds really delicious. Ooh, looks stellar! Apple pie lara’s are the best, but the chocolate chip is absolutely FAB. Thanks for the lemon idea, I can’t wait to work on a batch! I also love all things lemon! I will be making these over spring break for sure, and finally getting the time and solidarity to crank up the blender in the mornings for green smoothies. My how I have missed having both a stocked pantry and people in the house who DON’T mind my early morning noise and who like when I cook/bake them vegan things! Mmmmm, great recipe! I’m lovin’ all the ingredients. Oh these look delicious! I just tried hemp seeds for the first time a few days ago and I am hooked! They are so tasty and they go well with so many foods! Thanks for inspiring me to expand my vegan culinary horizons! These look fabulous — I am always looking for new homemade Larabar-like recipes, and these are going on my list. I can imagine that the lemon zest gives them that perfect extra kick of citrus! Thanks, Gena, as always. I love lemon in anything, these sound perfect! Im letting my nerd flag fly here – I LOVE stoichiometry! 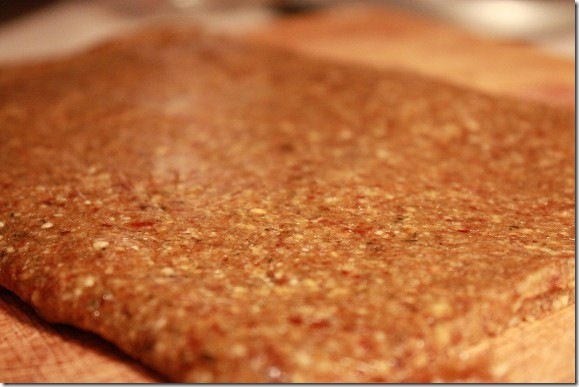 I’m a HUGE fan of making homemade larabars. It’s so much cheaper, and I love customizing the ingredients to exactly what I prefer. 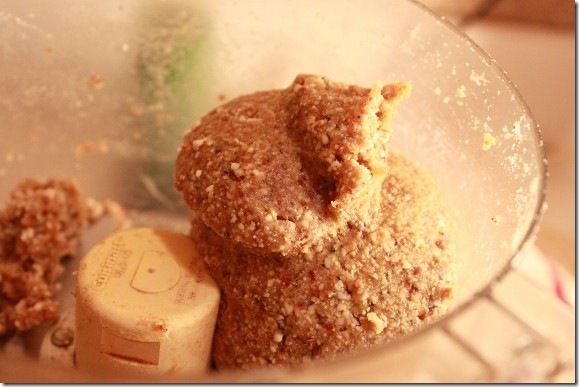 My favorite to date has been: dates, almonds, peanut butter, cocoa powder. It’s like dessert! I’ve been on such a lemon kick lately so as soon as I saw this post I knew I had to whip these up. I just did and cannot wait for them to be done setting! The bite of “batter” that I snuck out of the food processor was delicious. Thanks for another great recipe, Gena. These look great, I especially like that they include hemp seeds. I usually stay away from Larabars except when traveling since they’re so pricey, but I’m looking forward to trying this recipe. Thanks! Stoichiometry <3 I'm glad someone understands. These look awesome, I'm always looking for new bar/snack ideas for food on the run. Thanks! 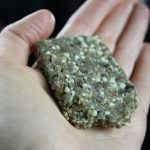 Would this work with Flax seeds, instead of hemp seeds, what do you think? Oh and how do you think it would taste if I substitute cashews with walnuts, almonds, or brazil nuts because I’m highly allergic to cashews. So great-looking and so simple! Definitely making these asap. I make almost all my own bars at home but I still find the packaged one’s so alluring when I’m at the store. Perhaps because I haven’t perfected all my recipes yet (or I’m getting sick of only eating things I’ve made). I’m definitely going to try your buckwheat chai bars soon! I had a Vega Vibrancy bar for the first time yesterday and really enjoyed it. I tend to find dates a bit too sweet for my liking..does anyone have a better idea on how to make the bar mixture stick together? I have just come across your blog, and I really love it! I look forward to reading more. 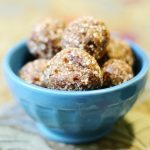 has anyone tried making these with almonds, a cheaper alternative to cashews?